Highlight Magic contains top flight routines for close-up, parlor, and stage. While not every effect requires some knowledge of sleights, some require mid-level skill. Nelson Hahne did the pen and ink illustrations, and as usual, his work is top notch, too. From the Publisher. Introductory comments from John Snyder, Jr., magic dealer and past president of the IBM. THE ATOMIC PENNY. An impromptu comedy close-up coin effect where the spectator is left with a bent coin as a souvenir of your abilities. THINK STOP. A simplified version of Professor Hofzinser's "Here, There, and Everywhere" card effect. REVERSED MISDIRECTION. A gag for magicians to use on other magicians. CENTERISE. A card effect where the selected card rises from the center of a borrowed deck. This is Berger's own handling for his "Ben Berger Card Riser" dealer effect. FLIPFAN. A flashy, flip-flop card flourish for the finger flingers. FINGER STAND. A very pretty card production where a card appears between each of the fingers and thumb of one hand ala multiplying billiard balls. POKER PLAYER'S DREAM. 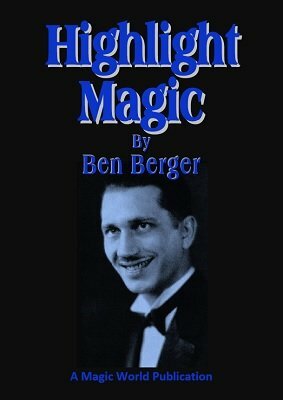 This routine fooled so many magicians that Berger was begged to include this in the book. NO-PREP. A no-skill card effect with an unprepared deck with an unexpected climax. CHANGO! Closing thoughts from the author. The original hard cover edition is quite expensive when you can find a copy for sale. Now this very nice work is priced within reach of every performer. 1st edition 1941; 1st digital edition 2016, 48 pages.